The Preservation Association of Central New York had an exclusive tour for its members and guests on Sunday, October 18, 2015. 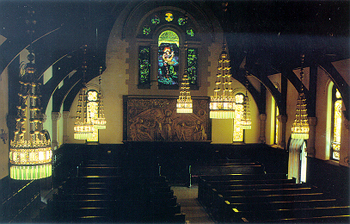 The Willard Memorial Chapel is “the only known complete Tiffany Religious interior left in existence in the world.” Built in 1892-1894, the chapel was designed and completed by the Tiffany Glass and Decorating Company with Jacob Adolphus Holzer as the primary designer, featuring his ceramic mosaics and glass tiles. In 1988, an antique dealer purchased the chapel from the Seventh Day Adventist Church and had Christie’s Auction House in New York City complete an inventory and possible sale of the various parts and pieces of this complete interior. The Community Preservation Committee, Inc. (CPC), a very small not-for-profit, tax exempt organization, made a purchase offer with a substantial down payment to save the Tiffany Interior. 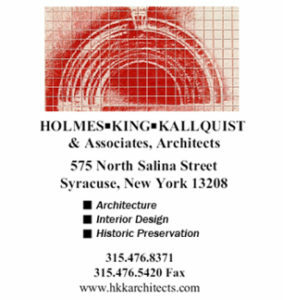 After listing it on the New York State Register of Historic Places, CPC was successful in receiving a $285,000 matching New York State Environmental Quality Bond Act (EQBA) grant to acquire and stabilize this important historic property. 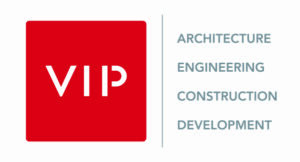 Subsequently, they also received grants from NYSCA, The State of New York and several other EQBA grants, and were touted by J. Winthrop Aldrich, Deputy Commissioner of Historic Preservation, as a tourism success story – this all assisted in the National Historic Landmark Nomination (NHL) process, which was successful as well. Michael Long, PACNY board member and chapel project manager, gave the tour and explained in detail how this group of individuals with a net operating budget of $2,500 banded together against all odds to purchase the Tiffany Treasure for $500,000. The Willard Memorial Tablet – Bas Relief signed by Holzer had an offer of $500,000 for that one piece from the Metropolitan Museum of Art in New York City to complement their Tiffany and Holzer collection. Completed at about the same time as the Tiffany Chapel at the Columbian World’s Exposition in Chicago in 1893, the Auburn site features glass tile mosaic floors, crystal chandeliers, rose windows and the spectacular “Christ Sustaining Peter on the Water” window directly above the Memorial Tablet. Not only did Tiffany complete the windows and chandeliers, they built the furniture, the endowed chairs, lectern and pulpit and all the pews as a matching set with semi-precious jewels inlaid with gold leaf stenciling. 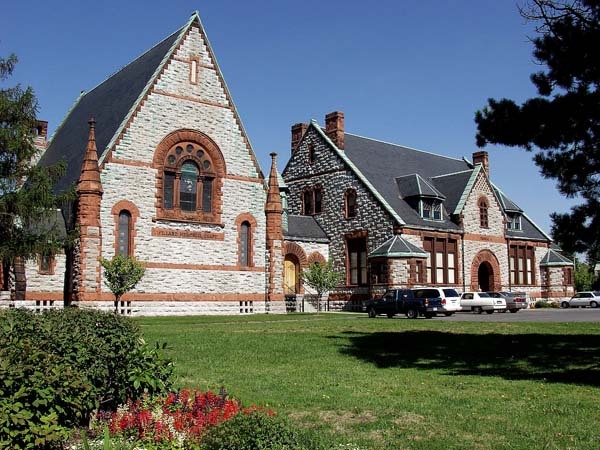 The Willard Memorial Chapel is home to several not-for-profit organizations and is available for weddings (30-60 per year) and community events throughout the year to assist with operating expenses. The City of Auburn Historic and Cultural Sites Commission assists with state and national promotion of the various sites in Auburn, which include the Harriet Tubman Home (in the process of becoming a National Historical Park), the William Henry Seward House Museum (Lincoln’s Secretary of State), and the Cayuga Museum (where Ted Case / FOX’s first commercially successful “Sound on Film” was made, creating the talking movie industry (now 20th Century Fox)). Please visit www.historyshometown.com to plan your visit to the Auburn, which is recognized as a “Save America’s Treasures Community” and home to five designated individual SAT sites. The second Sunday of December is the free holiday open house of all the museums in Auburn.